For a long time, infant cereal (most often rice) was considered the gold standard first food for infants. But in recent years experts have found that it's fine to launch a child's solid food career with vegetables, fruits, or even meats. Given that, bananas are an ideal starter solid food for babies. In fact, bananas are great food for babies, kids, and adults at all ages and stages: naturally sweet, soft enough to mash with a fork (or gum), and ripe with lots of key nutrients. Read on to learn why bananas have so much appeal (pun intended). A medium banana (weighing about 126 grams), has just 110 calories and 19 grams of sugar: Babies have a natural affinity for things that taste sweet and bananas deliver, which is why they're often so easily accepted by a baby who's moving on beyond breast milk or formula. They're particularly rich in potassium, a mineral that helps to regulate blood pressure, protect against kidney stones, and help to prevent bone loss that can occur with aging. Lots of foods contain potassium, and so a child who eats a healthy diet isn't likely to become deficient in the nutrient (a condition called hypokalemia). Bananas also boast a variety of other minerals, as well as certain vitamins, including vitamins A, B6, B12, folate. Three grams per fruit, in fact, making them a significant contributor to the overall daily intake of fiber. However, it's best not to give bananas to a child who's constipated (despite the popularity of the BRAT diet as a treatment for constipation, which involves bananas, rice, applesauce, and toast). This is because there are two components of bananas that actually can exacerbate constipation, tannins and amylase-resistant starch. Better fruits for helping a child to have regular bowel movements are green kiwifruit and prunes. Often foods are good for you by virtue of what they don't bring to the table as well as by what they offer. In the case of bananas, this means saturated fat, sodium, and cholesterol—all components of food that should be limited in a healthy diet for people of all ages. One of the great things about bananas for babies is how simple it is to turn them into homemade baby food, even on the go. They come in their own easy-to-remove jackets (no peeler or paring knife necessary), they don't have to be refrigerated, once peeled they don't need to be washed, and you can mash ripe banana into a puree with the back of a plastic fork— no fancy baby food-making equipment necessary. When buying bananas, choose fruit that's fully yellow in color and that separate easily from each other at the stem—both indications of ripeness. Of course, you also can purchase bananas that aren't still a little green and allow them to ripen in a bowl (outside of the refrigerator). Store unpeeled bananas at room temperature, not in the refrigerator. If you choose to puree a few batches of bananas, divide them into serving sizes and freeze them. You may notice that the puree turns brown; don't worry—this is natural and doesn't mean it's unsafe for your baby to eat. If it bothers you, though, dip slices into lemon juice, lime juice, apple juice, or lime juice; the ascorbic acid in the citrus will counter the process that leads to browning and shouldn't affect the flavor of the fruit. If it does, you also can try using club soda. As your child grows, you can continue to make bananas a key part of her diet. Keep giving them to her pureed or mashed until she's about 9 months old. You then can offer them as finger food in sliced and quartered chunks. By the time she's a year old, you can hand her a half or whole peeled banana. Before you know it, she'll be able to peel her own just like a big kid. Starting Solid Foods. American Academy of Pediatrics. 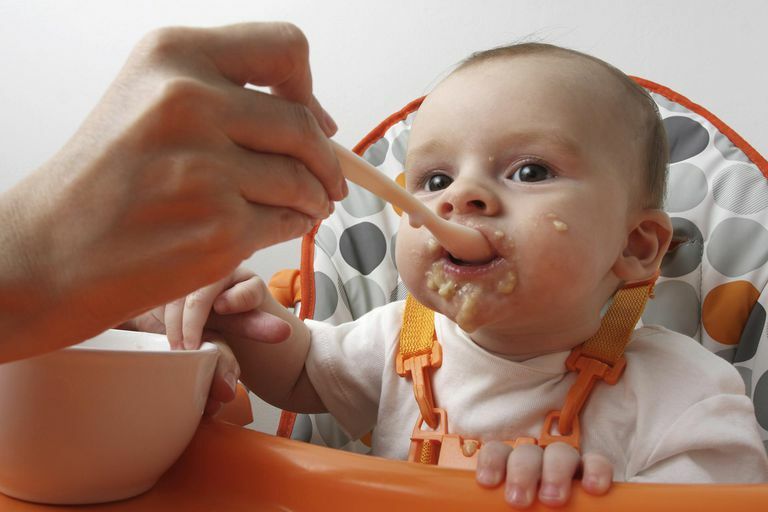 https://www.healthychildren.org/English/ages-stages/baby/feeding-nutrition/Pages/Switching-To-Solid-Foods.aspx.